This is, as it says, where the soaps made with non-milk liquids are, and those that are limited edition. "Limited Edition" doesn't necessarily mean that these are only here for a short time (although that might be true! ); rather, these are made with scents that I got as samples, or maybe the scent didn't fit what I had in mind. Rather than be forced to use soaps that I don't find fit *my* nose, I'll list them here. These soaps are still made the same way as the Goat's Milk soaps are, and they are just as good. NOTE: As of 10/01/15, we are out of stock on the Whey Cool soaps. I didn't get to make cheese this year, so...sorry! I'll try to get back on the cheese making wagon in the Spring. This is a fun soap - it's made with some of my husband's homebrew. It's unscented - with fragrance oils, anyway. The soap itself smells faintly of...well, a brew store - you can smell the hops and grains. It lathers beautifully! Colored with brown oxide to make it more "beer-like". Made with Olive, Coconut and Soy oils. Due to my limited access to homebrew (he'd rather drink it than let me soap it! ), this truly is a limited edition (although I was able to make...a whole lot of soap from the wort he let me have!). As you can tell by the name, this soap is made with Whey. The scent is lovely, lovely Patchouli with a bit of Rosemary - it reminds me of the Ren Faires we love to go to. It's very deep, with a musky, smoky fragrance. It's a good scent for all genders. Swirled with green oxide. Made with Olive, Coconut, Castor and Soy oils. Due to the limited amount of whey, this soap is a limited edition. Ah, the scent of Bay Rum! A lovely masculine scent that brings to mind pirates. Or privateers. 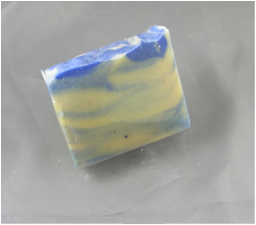 Made with whey, swirled with blue oxide - this is a really nice soap! This soap is VERY Limited in Quantity - if you want more than 2 or 3 bars, please email me to see if I can accommodate you! There's an old saying "As American as baseball and apple pie"...that's what I was going for with this soap. I nailed the colors - soft swirls of glittery red, white, and blue - but the scent? I wanted apple pie; what I got was a very soft apple. Nice, but not what I had in mind. I'll be working on this one, though - I really like the swirls! THIS IS MADE WITH GOAT'S MILK!